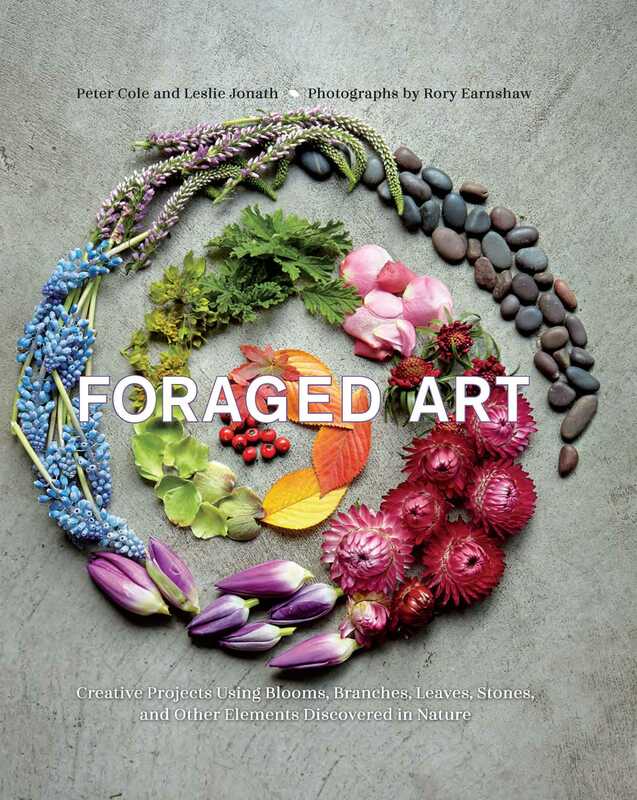 Art, meditation, and nature meet in this adult focused activity book, with projects that take inspiration from the natural environment, using blooms, pods, branches, stones, and other natural elements. Divided into chapters by natural elements -- flowers, leaves, rocks and pods, and more, the book will encourage readers to forage and play outside using nature's seasonal art box. With quotes by artists on nature and creativity, the book is about making art from what you find and finding art in what you see. Grass-Lined Steps - Adorn a plain set of concrete steps with stripes of living color. The bold, colorful, strappy leaves of a New Zealand flax plant come in bright shades of yellow, pink, red, and bronze. Excellent as container plants, flax plants can also be spectacular planted in the ground—in a garden or along a walkway. Here, the neutral grey of the concrete makes an ideal background on which to affix vertical stripes of color. Recontextualizing the radiating leaves as flat surfaces also highlights the smooth texture of the leaves and the striations in color. Rather than bringing the outdoors in, this treatment brings the indoors out: When lined up in strips, the broad, sword-shaped leaves begin to look like wallpaper. After attaching the blades to the step, they’re trimmed to size, making each embellished rise a work of art. For this project you’ll need large, well-sharpened, sturdy scissors or garden shears, a ruler, and a roll of removable double-sided tape, available online or in craft supply stores (other kinds of glues may leave residues or be hard to remove). If you don’t have access to flax, you can create this effect using different kinds of leaves and wide grasses. Gather: Collect the leaves of flax plants or similar leaves and grasses. Make sure they’re in good condition and free of spots. Choose long leaves that are consistent in size with even edges. Using sharp scissors, harvest the leaves close to the root. If you’re harvesting from living plants, select only a few outer leaves to make sure there’ll be no lasting damage. Compose: This project is best done on smooth steps that have a back riser. Arrange the blades with similar widths and hues. Notice how stripes of various colors take on new beauty when placed on a flat surface. Create: Measure the height of each riser. Use the ruler, or hold the leaf against the step to measure each blade to size. Then use the scissors to cut each blade of grass to length. Design your pattern on the ground, grouping blades with similar widths or hues. Adhere each leaf to the step vertically with removable double-sided tape. Leave No Trace: When you’re ready to disband your Grass-Lined Steps, remove and discard the tape and let the leaves return to nature.